Powada is a well-known genre of Marathi literature. It is a genre of ballads, originally sung by the members of the Gondhal (Gondhia) caste, which is a Dalit community. Post-Shivaji, all castes adopted it. The powada ballads were centred on wars. The singers painted a very vivid picture of different battles. This genre must have originated in the times when internecine battles and attacks by invaders were common and it had become a bounden duty of a poet to inspire his patron to fight with all his might. But Mahatma Phule used powada for spreading awareness among the masses. During the Independence struggle, powadas became the songs of national movement and, after Independence, of people’s movements. In old Marathi, powada means “to glorify”. Those who sing powada are known as shahirs in Marathi. The word “shahir” is as old as the Marathi culture. The shahiri literature is said to have marked the origin of Marathi poetry. Powada is considered a credible chronicler of the contemporary Maratha history. The history of powada begins in the 17th century. But in the Yadav era, prior to Shivaji’s anointment, the devotional songs that were sung in Gyaneshwari were also a form of powada. The era of Chhatrapati Shivaji Maharaj (1630-1680) was the golden age of powada. The classic powada emerged in this period. 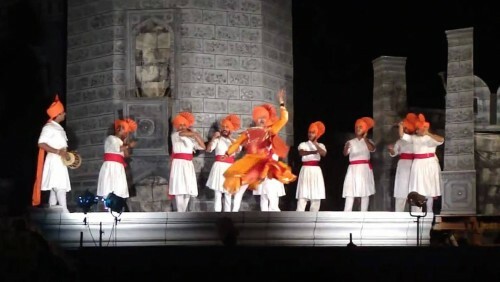 Shahiri literature originated during the rule of Shivaji Maharaj. The first powada, Afzal Khanacha Vadh, (the killing of Afzal Khan) was sung by Agnidas in 1659. This powada describes the killing of Afzal Khan by Shivaji in stirring words and finds mention in Maharashtra’s gazette. Another important powada was about the capture of Singhgarh fort by Tanaji Malsure. It was first sung by Tulsidas. Equally important is the powada about Baji Pasalkar sung by Yamji Bhaskar. There were many powadas centred on Shivaji like Shivaji Avtari Purush, Shiv Pratigya, Pratapgarhacha Ransangram, Shahistakhancha Parabhav, Shivaji Maharaj Powada, Chhatrapati Rajamata Jeejabai, Shivrayanche Punyasmaran, Singhgarh, Shivrajyabhishek, Samajwadi Shiv Chhatrapati, Shiv-Gaurav, Shivdarshan, Porogami Shivaji, Shivsambhav, Shivkavya, etc. In the Peshwai era (1762-1812), Ramjoshi was the singer of powadas. Ananphadi (1744-1819), Honaji Bala (1754-1844) and Prabhakar (1769-1843) were other prominent and prolific singers of powadas. Subsequently, this art form faded away. But powadas – as a classic Marathi folk art – did play a key role in promoting Marathi literature. Mahatma Jotiba Phule traced the samadhi of Shivaji and in 1869, celebrated Shivaji Maharaj’s birth anniversary in Pune for the first time. He got the samadhi repaired and his first book was A Ballad on Shivaji, which was recorded by the British. Phule realized that powadas were an important source of history. As it was both a song and a poem, a powada could become a vehicle for entertainment as well as for creating awareness. Phule introduced the unlettered masses to the exploits of Shivaji. He did not just write individual-centric powadas; he used them as parables. He used simple language to help people understand the greatness of Shivaji and be inspired by him. Later, many powadas were written to oppose the British Raj. But it is surprising that it was the British who compiled and preserved powadas. The best example of this is Harry Arbuthnot Acworth, who, along with Shankar Tukaram Shaligram, collected around 60 powadas and published them in 1891 under the title Itihaas Prasiddha Purushanchi Va Streeyanche Powada. In 1894, Acworth’s book Ballad of Maratha was published. The British dug out five to six powadas of the era of Shahu Maharaj, 150 of Peshwai era and 150 of British era. Till 1947, the British had collected and compiled more than 1000 powadas. The names of many shahirs could not be discovered. Dr S.P. Goswami published some old powadas, including those of Rao Barve Gyanprakash. These powadas were expressions of anguish against the British rule. Yashwant Narsingha Kelkar published three volumes of powadas, which helped preserve this ancient art form. If Gondhias preserved the history of Maharashtra, publication of powadas saved this vocal tradition from becoming extinct. Shahiri literature produced great writers, including Shripad Mahadev Varde, M.V. Dhondh and many others. Varde collected many famous powadas and had them published under the title Vividhvaarta. He also wrote a book titled Marathi Kavitacha Ushakaal Kinwa Marathi Sahitya. M.B. Sahastrabuddhe’s Marathi Shahiri Vangmay was published in the 1950s by the Mumbai Marathi Sangh. All these writers did a great service by compiling and publishing the literary history of powada. The Samyukta Maharashtra Andolan of 1956 gave birth to the shahirs Amar Sheikh, Annabhau Sathe and Gavhankar, who belonged to the Communist Party of India. They used powadas to expose the flaws in the government’s functioning and policies. These were a different kind of powada and were used to build a movement against the government. These powadas were neither religious nor sang paeans to kings or emperors. They put forth the demands of the people. They talked about the problems of workers, they talked about famines, they gave voice to the poor. The shahirs were now talking about social problems – about exploitation, injustice and atrocities. These powadas were not recording history, they were telling the rulers about the problems of the people. This gave powadas a new dimension. In the 1980s, Vilas Ghongre and G. Sambhaji Bhagat took the tradition of Annabhau Sathe and Amar Shaikh forward. The powada became the clarion call of the leftist movements. The problems and miseries of the workers and the farmers became the subject matter of powadas. Today, Sambhaji sings powadas attacking imperialist forces, religious-communal fanatics and the caste system, and to spread Ambedkarite-Marxist ideology and for people’s cultural unity. Today, he is the most famous folk shahir of Maharashtra. More than three hundred shows of a play Shivaji underground in Bhimnagar Mohalla based on powadas have been staged.